Most ac electrical motors are overrated for the task required, for example fans blow too much air and pumps pump too much liquid, this will create extra noise, cause additional wear and waste electricity. By fitting a variable speed drive the motor speed can be trimmed for optimum performance, this can be ‘open loop’ or in a ‘closed loop’ situation where the speed alters automatically as conditions change. Reduction in power consumption – giving short ‘payback’ periods. Reduction in wear – reducing maintenance requirements and downtime. Improved working environment – reduced noise. Improved temperature and pressure control. We are so confident that we can save client’s money by fitting variable speed drives that we offer a free no obligation survey where we identify electric motors that will benefit from having a variable speed drive fitted. This survey will then list the expected power savings together with the payback period. Recent Case Study – Saving £23.18 per day with a payback time of just 242 days. 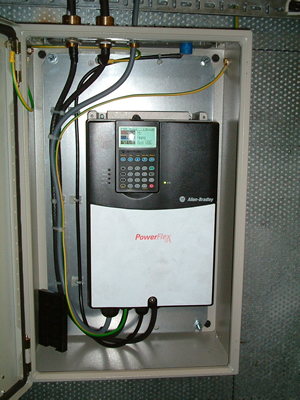 A 22Kw ventilation fan was fitted with a variable speed drive. Once the inline flaps had been opened and the system balanced the actual speed required was reduced from 1170 RPM to 683 RPM. This reduced the vent air noise by 12db and lowered the power consumption from 20.7Kw to 4.6Kw a saving of 16.1Kw. With this fan running 24 hours a day and electricity typically costing 7p/Kwh a saving of £23.18 is made per day. This means that after just 242 days the VSD has paid for itself and is saving a lot of money. Not to mention the savings in maintenance and the improved working environment. Please contact us for prices or to arrange a free no obligation survey.